A landslide in February damaged the main road access to this beach. Repair work will not be finished before Christmas – the shop and café are also closed and the only access to the beach is via low tide. We’ll keep you updated. 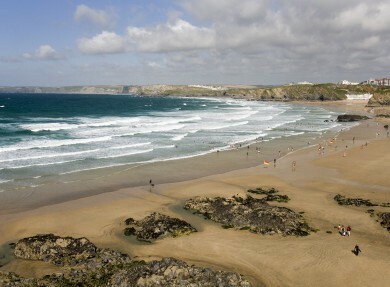 One of Newquay’s four main beaches, Great Western, is described as the quietest. Sheltered by high cliffs and recommended by the Marine Conservation Society for the quality of its water, it’s a popular spot for families and novice surfers. At high tide the beach all but disappears. When the tide goes out it joins with neighbouring Lusty Glaze, Towan and Tolcarne beaches to form a vast expanse of soft golden sand. Great Western Beach is two minutes walk from the centre of Newquay and the nearest car park. Access is via a steep winding path although there is disability access via a private lift at the Great Western Hotel. Facilities include toilets, first aid post, cafe, deck chairs, wind breaks and surf equipment hire. Lifeguards patrol the beach from the end of May to the end of September and dogs are welcome all year round. The moderate Atlantic swell – perfect conditions for learning to surf and improving your basic technique. Exploring the caves and rock pools in the cliffs at the back of the beach or walking to neighbouring beaches at low tide.